But there is more to report: We got in contact with IJP, that is the “International Journalists’ Programmes”. 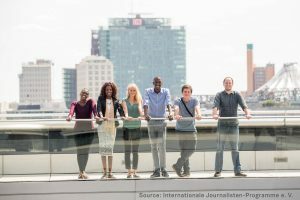 IJP is an independent and non-profit organization of German journalists, which has offered exchange programmes for young journalists for more than three decades. We are very grateful that IJP gives us the opportunity to integrate “our” scholar into their Southern African-German-Journalists’ Programme, which takes place in June and July. Not only will we benefit from IJP’s multiyear experience in organizing and realizing successful exchange. It also means that “our” scholarship has now been upgraded to a seven! week stay in Germany plus one week in Accra. IJP – Fellows 2017 in Berlin. Quelle: Internationale Journalisten-Programme e. V.
week 7: internship in the science section of a German media house.